Manitowoc ... represented by YBA Kanoo. Manitowoc marked major success in the Middle East recently with sales of Grove and Potain brands of cranes. One of Manitowoc’s most sought-after all-terrain cranes, the Grove GMK4100L-1, increased its popularity further at this year’s bauma – the world’s leading trade fair for construction, building material and mining machines and construction vehicles and equipment – with a high number of sales to crane rental and heavy equipment companies. One of the largest crane orders received was placed by the crane rental company Abdullah S Al Mesallam Establishment of Saudi Arabia, which purchased five machines, with additional companies from the Middle East also placing orders of the GMK4100L-1. The crane was launched at the end of February and proved a great success at the trade show, which was held in Munich, Germany, in April. “These sales demonstrate that the Grove GMK4100L-1 is one of the modern success stories of the all-terrain crane introductions,” says Andreas Cremer, global product director for all-terrain cranes and truck-mounted cranes at Manitowoc. Several cranes were also ordered by companies based in Europe. Meanwhile, Manitowoc managed to sell the first four Potain MDT389 cranes in the Middle East at a conference recently held in Cairo, Egypt with long-standing Grove and Potain dealers Orascom Trading and International Development Programmes (IDP). According to Ahmed Talhimet, sales director for Manitowoc Cranes in the Middle East, the conference was a great opportunity for the company to highlight its products and support to customers in the region. During the seminar, Manitowoc presented the company’s latest tower crane range which includes the new Crane Control System (CCS) operating system. Manitowoc product managers discussed the key advantages that CCS brings to Potain and Grove cranes. The user-friendly control system will be progressively installed on all new all-terrain models, as well as crawler, rough-terrain and tower cranes, achieving the highest level of comfort, ergonomic control, and lifting capacity, Talhimet says. At the event, the company also presented its new five-axle Grove all-terrain crane range. 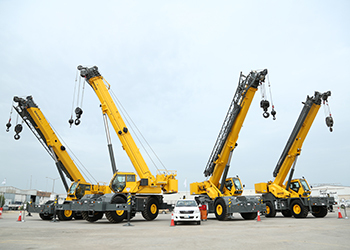 Earlier this year, YBA Kanoo, Manitowoc’s long-standing distribution partner in Saudi Arabia, showcased almost the entire range of Grove rough terrain cranes during a spectacular open-day event in Dammam. Models on show included the RT530E-2, RT 540E, RT550E, RT650E, RT765E-2, RT770E and a RT890E. The open day saw Manitowoc reinforce its commitment to the Middle East region and highlight its strategic focus for innovative new products. More than 70 customers as well as senior representatives from Manitowoc attended the event.